Oh my word, you guys. Hold onto your coffee cups. 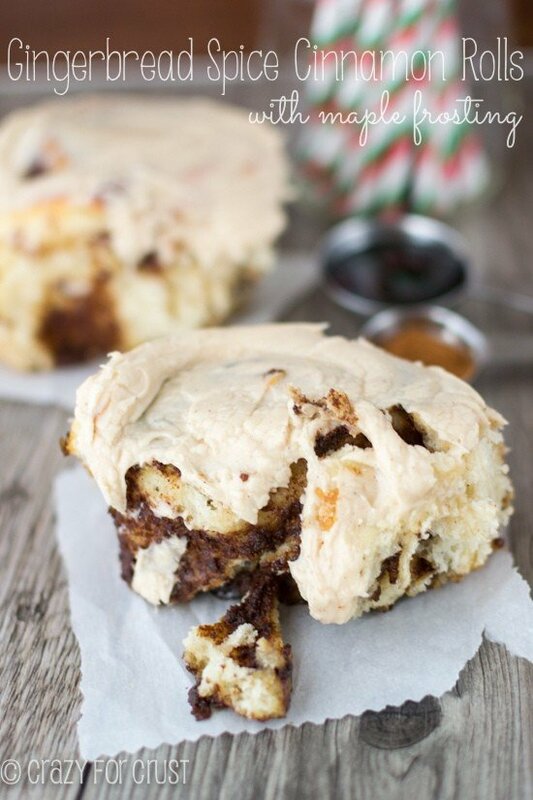 Apple Cider Cinnamon Rolls, with apple cider in the dough and the frosting. They’re like walking in an apple orchard! Are you smarter than a 4th grader? I’m not. Last week Jordan had her first 4th grade social studies test. We had flashcards and a study guide to practice with. Thank goodness they were already filled out or we would have failed. Regions of California, natural resources, a compass rose (no, that’s not something from Beauty and the Beast, it’s a real thing) and the exact location of our city, using degrees. Dude, degrees mean baking, not latitude and longitude. Geography was never my strong point. Now baking? That’s something I can do. 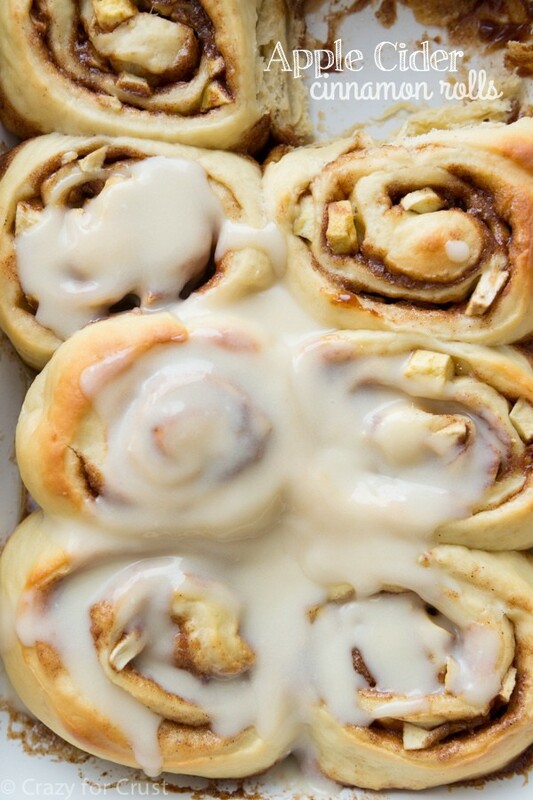 Although science was never my strong suit either and these apple cider cinnamon rolls are full of science. I told you last week about our trip to Apple Hill. I go for the doughnuts but I also love their apple cider. They make it fresh on site. I came home with a bottle because I knew I wanted to try making a yeasted dough with it. I thought I was being all smart and stuff, switching out the milk for apple cider in my cinnamon roll recipe. Then I googled and realized I’m not smart at all. Can we just pretend?? The icing is a cream cheese base with apple cider instead of extract. So that means I can drink it, right? 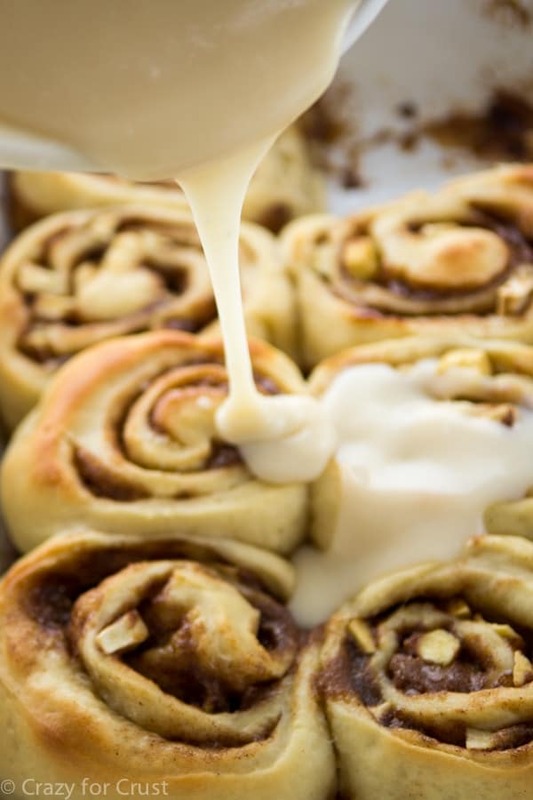 The cinnamon roll base I used for this recipe is the same one I used for the Peanut Butter Cinnamon Rolls, Zucchini Cinnamon Rolls, and the Cinnamon Roll Pull-Apart Bread, except that I took out the milk and used apple cider instead. The apple cider has natural sugar in it, which means that yeast loves it. I warmed up the cider the same I do with milk and added the yeast and within a minute it was frothy and yeasty. That also made my dough rise faster than usual, which was good because I started these late in the day. The filling is the regular filling I use in my Overnight Cinnamon Rolls. That post also has a photo tutorial on rolling out your dough, if you need one. Because I was using apple cider in these rolls, I decided to chop up some apples in the filling. I know I’m going to get questions about what kind and my advice is use what you love. I really have no idea what kind these were – they came from an orchard with lots of trees that all had apple names I’ve never seen before. 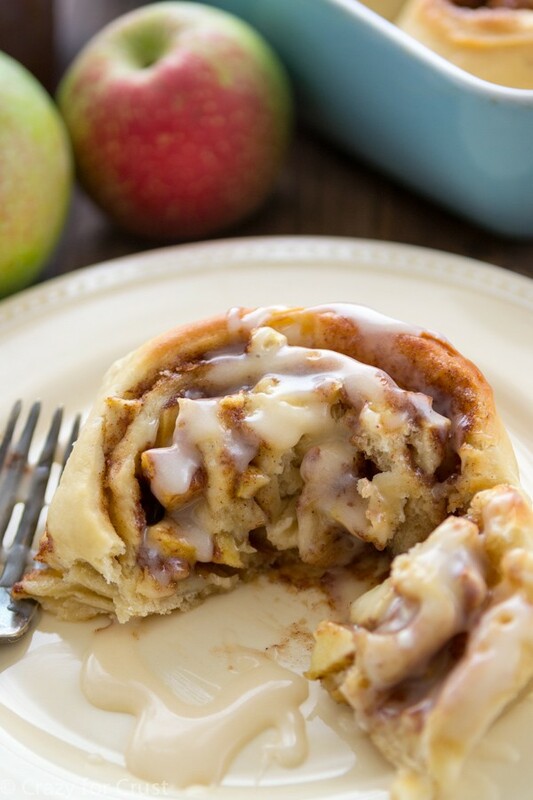 Note: the apple doesn’t cook to “soft” in the cinnamon rolls. If you want a softer apple, like a pie apple, you need to pre-cook them. I added a note in the recipe. Pour the frosting on top of the warm rolls and see what happens next. 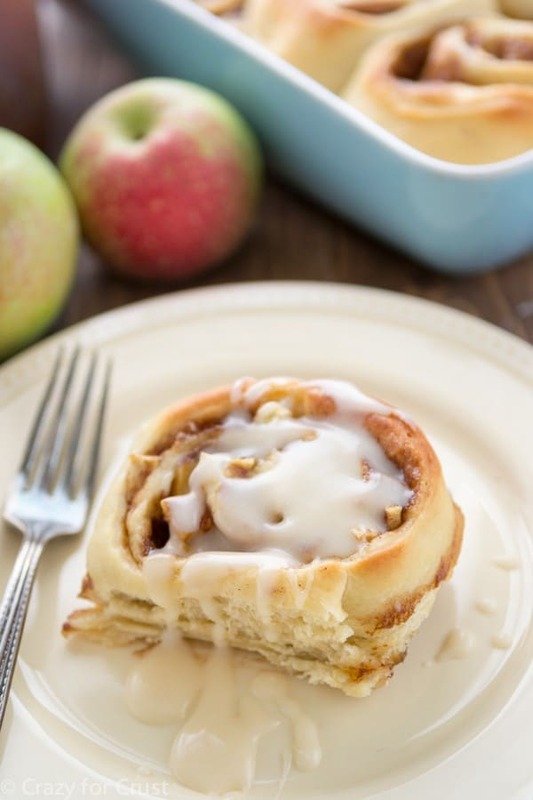 Each bite of these cinnamon rolls is not overly apple tasting, but the flavor of the apple cider comes through immediately. As you’re chewing you almost feel like you’re drinking apple cider. So, I guess that means I did my job. Now I just have to learn 4th grade social studies. I think that will be harder! 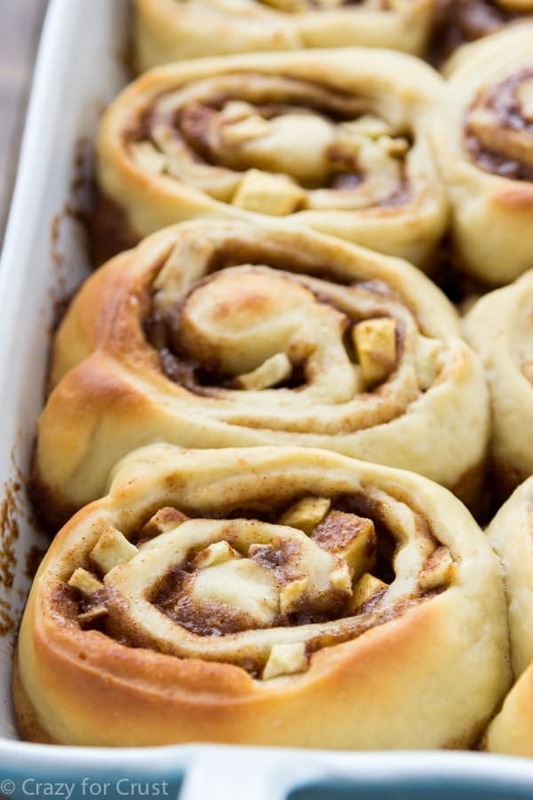 These rolls have apple cider in the dough and the glaze, and apples inside. 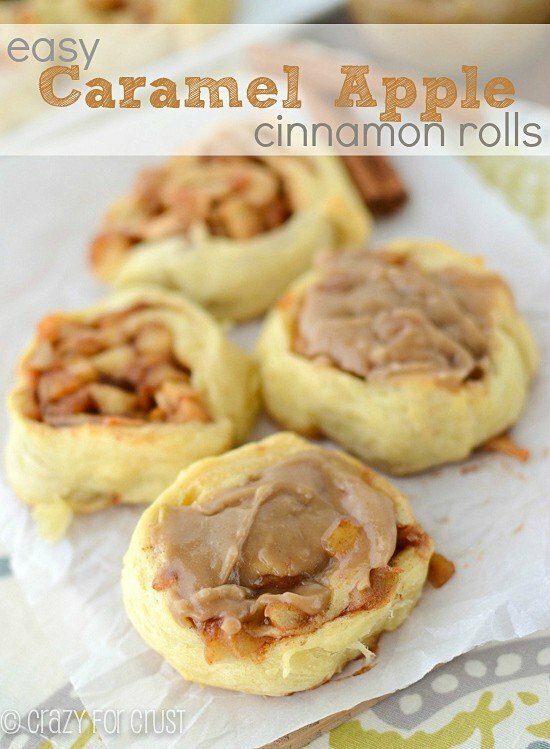 They're soft and gooey and full of apple flavor! Place apple cider in a microwave safe measuring cup. Heat for about seconds in the microwave, until it’s about 110-120°F. (The time you heat it will need to be adjusted depending on your microwave. You can use a candy or a meat thermometer to test the temperature. Also, think very hot bathwater.) Add yeast and stir. Let it sit for a few minutes. Place sugar, butter, salt, and egg in the bowl of a stand mixer fitted with the paddle attachment. Mix until the butter is distributed throughout the liquids, although it may be chunky. Pour in the cider/yeast mixture and stir for a few seconds. Add 3 cups of flour and stir with the paddle attachment just until the mixture starts to stick to the paddle. Then replace the paddle with the dough hook. Continue mixing on low speed until the dough forms a ball in the center of the bowl. If dough is still very sticky, you can add an additional 1/4 cup of flour, 1 tablespoon at a time. Spray a large bowl with cooking spray and place the dough ball in it. Spray the top of the dough ball with cooking spray (lightly) and cover the bowl with plastic wrap. Let sit for 1-3 hours until it doubles in size. Note on rising: if your house is warm, it should rise no problem. If it’s cold in your house, it may take longer for the dough to rise. Stir together butter, brown sugar, cinnamon, and flour until it forms a paste. Roll the dough up tightly from the long end. Decide how many rolls you want. You can make 8 big rolls, 9 medium, or 12 small. (8 rolls: 8x12” pan, 9 rolls: 9” pan or 9 1/2” round pie plate, 12 rolls: 9x13” pan.) Place the rolls into a pan that has been sprayed with cooking spray. Cover the rolls with plastic wrap and refrigerate overnight. Whisk the melted butter and softened cream cheese until mostly smooth. If your cream cheese is too stiff, you can use a hand mixer. Whisk/beat in powdered sugar and 3 tablespoons apple cider. Add more cider as you want for consistency. Pour over warm rolls and serve. Hi, you should shred the apple so you don’t have hard chunks and it will be even gooier filling! Can’t wait to try! Simply delicious. Just started baking six months ago and have made three sweet roll recipes so far. These were definitely the best.